Wave 9 for FY 2018 was released Friday, June 8th for $66.8 million. Cumulative funding as of Wave 9 is $1.10 billion. Wave 10 is expected later this week. 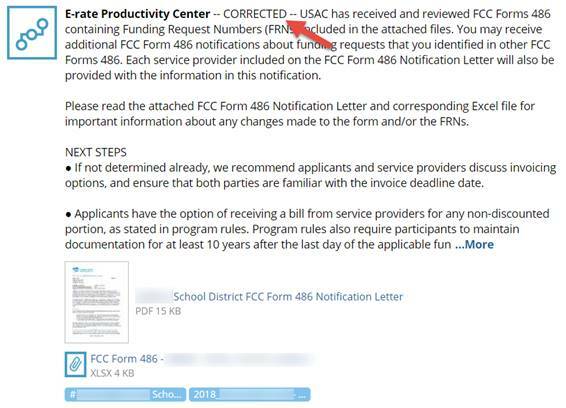 USAC issued a number of “corrected” Form 486 Notification Letters last week. Many of the original letters, issued in May and still available in the News feeds, included the cover letter but failed to include the report portion of the PDF file. The EPC News feeds for the revised letters are prominently labeled “CORRECTED” and now include all pages of the PDF files. When Universal Service Fund (“USF”) banking was transferred from commercial banks to the U.S. Treasury earlier this spring, applicants and service providers were assured that the transfer would be transparent to end users. Scattered reports now indicate that such transparency may not always be the case. Historically, USAC would not pay invoices to applicants and service providers who were on “Red Light” status. i.e., those owing money to either USAC or the FCC. By a broader token, the U.S. Treasury will not pay, or will reduce payments, based on any outstanding federal agency debt. Currently there appears to be no reciprocal link from the U.S Treasury back to USAC if BEAR or SPI payments are reduced due to federal repayments. As a result, it is possible that USAC invoice notifications may indicate E-rate payments in excess of amounts electronically transferred. Additional information, should this occur, can be found on the Treasury Offset Program site or by calling 800‑304-3107. June 20 USAC webinar on Understanding Post-Commitment Actions. June 30 Last day to file a special construction implementation deadline extension request for FY 2017. July 2 Reply comment deadline on the FCC’s Notice of Proposed Rulemaking (“NPRM”) on Protecting Against National Security Threats to the Communications Supply Chain Through FCC Programs (see FCC 18-42). President Trump has nominated Geoffrey Sparks to fill the remaining four years of the minority Democratic term held by Mignon Clyburn (who is stepping down). Mr. Sparks is a communications attorney, most recently serving as an assistant bureau chief of the FCC’s Enforcement Bureau. Have the same functionality as the original product or service. Not violate any contract or state/local procurement laws. Not result in an increased percentage of ineligible services or functions. Be consistent with the establishing Form 470 including any associated RFP. USAC clarified that answering “Yes” to these certifications means that the statements are true — and that “No” means they are not true. While this seems obvious, this guidance is welcomed due to the ambiguity of the certifications’ phrasing. The USAC News Brief also referenced Release Notes and Frequently Asked Questions (FAQs) on the USAC Open Data platform.